High in the Redridge Mountains, east of Lakeshire and north of the Swamp of Sorrows, lies a dangerous, rocky region known as the Forbidden Moorlands. Once simply the Russet Moorlands, it was discovered ages ago by the Empire of Arathor. They came in search of a new port, but found an inhospitable land with nearly sheer cliffs on all sides. Stubbornly, they tried to carve out a place in the moorland, despite the perilous terrain and wicked wildlife. They constructed a lighthouse at the one place with an unobstructed shore, and a series of signal towers to light in case the empire ever needed to broadcast an alarm to those living in the mountains. It was not long before the empire abandoned the land, however, as they discovered that it had more than mortal dangers to fear. Before even the Empire of Arathor, early humans, descended from the Vrykul, had made their homes in the cold caves of the Moorlands. These humans had made dark pacts with evils beyond their imagining, and they had cursed the land. Knowledge of the land, except that it had become forbidden, was lost to history, however. So when an enterprising noble discovered the stone of the Moorlands while lost in the mountains and found it perfect for his construction project, he was unaware of what he was stirring up. In fact, he never truly realized what he had done, at least not in life. The stone he had quarried out was brought out of the mountains to an auspicious spot near the town of Grand Hamlet. There it was formed into the great tower of Karazhan, and coated in ivory. The stone reacted with the convergence of ley lines that the tower had been built on, however, and a magical explosion was unleashed. The land was broken and became skull-like in shape, as it slowly decayed into what is now Deadwind Pass. Afterwards, the quarry was abandoned, and the Moorlands were dormant once more. Recently, however, things have begun to stir. After the Cataclysm, the Stonegullet Ogres broke free from their black dragon masters and fled into the Moorlands, followed by a band of ettins. Meanwhile, magi across Azeroth have noticed strange fluctuations originating from the forgotten land, and have come to the conclusion that the Legion is involved. Knowing that they need a foothold to assault any enemy position in the treacherous Moorlands, the Alliance and Horde have come to the Stonegullet Ogres to find out what the Legion is up to. The player arrives with the Alliance and Horde, who have taken up old Arathi structures that are part of the ogres’ new town. Initially, you contact an ogre oracle in the cliffside by Gruul’s Legacy to determine exactly what kind of forces you might be up against. It is determined that your first foe is the natural wildlife and terrain of the land, who are so dangerous as to make any real foothold against the greater enemies impossible. After the land just past the Gorge is secure for siege weapons and armies to move about, the player is tasked with rooting out the ancient humans, who the oracle sees as the Legion’s main source of foot soldiers in the land. These fights culminate in a showdown with an unexpected enemy at the Journey’s End lighthouse, overlooking the Forbidding Sea. Afterward, the lighthouse is lit and more troops come from the sea to reinforce the initiative. With their position finally threatened, the Legion reveals themselves in full, putting up a strong offensive at the Coal Belt. After helping to secure the line, the player crosses the Great Bridge to light the Signal Tower, informing troops from down the mountain that its time to reinforce the other side of the Moorlands. These troops set up the Staging Camp, next to the last fully intact Arathi tower. The Alliance and Horde find it impossible to assault the Legion yet, however, as their fel magic has infused the bogs and the nearby quarry, providing too many fronts to fight on. The player helps to secure these fronts in either order. The Red Bogs are ultimately secured with the help of druids, while the quarry is ultimately sealed off from the greater mountains in order to stem the tide of demons pouring from them. Eventually, the mountain is surrounded, and the player enters to find a place carved out quite thoroughly. There you find a group known as the Legion of Malchezzar, who have been experimenting with portals, using the stones from the quarry. The stones are revealed to have been imbued with the waters of the Well of Eternity in the ancient past, and the residue remains. In the final room, you notice old portals to Demon Fall Canyon and Karazhan. Your ultimate goal is to stop the culmination of the Legion of Malchezzar’s experiments, a portal to the Twisting Nether. Of course, you get there just late enough that one major demon comes through. After the final battle, your faction applauds you for in heroism in holding back the Burning Legion, and they begin to devise a way to turn the portals back upon the Legion. The caves around here are cold, (name), very cold. Cold enough for the water dripping down the walls and from the ceiling to turn to ice. This ice is now a major part of the structural integrity of the cave. That’s where you come in. There’s a nasty bog running through one of the lower levels of the caves. A bog full of fuel. Take this torch and light the bog. The fire will spread quickly, and the heat will begin to melt the ice. Be careful, you won’t have much time to escape once things begin to fall apart. An ogre? So you’re Horde? No, Alliance? Wait, this is before the Night Elven revolution right? Oops, never mind my big mouth. I’m visiting from the Caverns of Time, you see. Ignore what I just said. Anyway, my girlfriend and I were vacationing here when we were attacked by some purple men. They took her to a cave not far from here. The problem is, I can’t get up to the cave entrance, so I need your help. I saw some Crag Bats swooping around the area, maybe if you could bring me a couple of their corpses, we can use them to glide into the cave. The yeti to the north trouble me. They think they can eat big ogre food. Teach yeti king lesson he not forget. He eat ten of our warriors, so you cannot fight him directly. Instead, go to Chef Brawn. He owe me one o’ his disgusting mystery meat pies. Take it and throw it at the yeti king. If he can’t see, maybe he run off cliff. Hey, you. Yes I can talk. You see, I am a druid. I was investigating these tunnels under Mount Malchezzet when I was captured by a Neanderthal. He put some kind of enchanted shackle on me that seems to be preventing me from shifting forms. I overheard him mention that a kobold ate the key. If that’s true, it shouldn’t be hard to find. It’s got to be the only kobold in this entire cave network. Have you seen the spitting plants that grow on the standing stones near the Red Bogs? They were once a thriving growth that spread across this entire mountainside. Whatever has gotten into the Red Bogs has also affected them, and I do not know the extent nor the nature of the damage. Please, could you dissect a plant and bring me a seed? 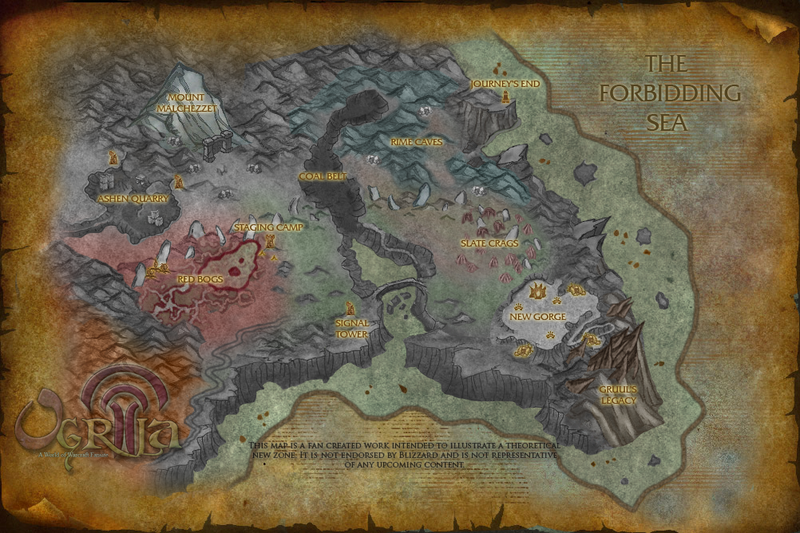 Based on an unused part of the world before it was removed in Cataclysm, the Forbidden Moorlands are placed directly to the east of the current Redridge Mountains. Paths will be added ascending the mountains in the northeast and southeast of the zone, branching from the path that connects the Burning Steppes and the Swamp of Sorrows. The overall shape of the zone is a steadily inclining, massive piece of earth, surrounded on the east and south by sheer cliffs and seas full of jagged rocks. The zone will provide a new, harsh terrain type in the highest point of the current Redridge Mountain Range. The unique climate of the area will feature flora and fauna exclusive to the area, as well as awe-inspiring rocky outcroppings, similar to Blade’s Edge Mountains, and treacherous peat bogs. Players will start in New Gorge, the Stonegullet Ogre village atop Stonegullet Plateau, which exists at the very tip of the Forbidden Moorlands. The village is made out of several ogre mounds cut into the sides and top of the plateau and remnants of Arathi construction. To the southeast are some treacherous paths that lead down the cliffside somewhat, and to Gruul’s Legacy, a rock formation that resembles the spines on a gronn’s body. The two main roads from the plateau are the Great Bridge to the west, which is a bridge spanning a deep ravine made from the very mountain itself, and the Slate Crags, a nest of jagged rocks protruding from the surface of the mountain. North of the crags, alongside the edge of the Forbidden Moorlands, are the Rime Caves, a series of caves and cave networks that have been claimed by the Neanderthal, a primitive tribe of humans that still carry heavy amounts of their Vrykul heritage in their blood. On a nearby cliff is a ruined lighthouse known today only as Journey’s End. The Rime Caves end at the Coal Belt, a path that cuts through the Forbidden Moorlands until it runs off into the sea. It was once a series of peat bogs until they eventually eroded together and emptied into the sea. The Coal Belt is the only feature to break up the series of higher hills, rocks, and standing stones that bisect the zone, starting from the western edge, snaking up the Moorlands and over to the Plateau. These pass by the base of Mount Malchezzet, a particular large mountain rising from the northern edge of the Spine. This mountain is honeycombed with tunnels, caves, and other places where dark things hide. Across the Great Bridge is a tall tower dating back to the Arathor period. Known as the Signal Tower, it is part of a string of towers that cross the zone heading north across the standing stones and northwest past Mount Malchezzet. The towers are empty now, and in serious disrepair, but evidence suggests they were abandoned long before they had outlived their usefulness. One of these towers is serving as a base camp for Alliance and Horde forces in the west. A small military outpost, complete with palisades, known as the Staging Camp, faces the Red Bogs, a dangerous series of raised peat bogs named for the clay collected around their edges. Many strange plant-like creatures roam the area, and the ogres want to make sure they stay in their bogs. To the northwest of the bogs and at the base of Mount Malchezzet is the Ashen Quarry. It has been sitting unused for generations now, and has collected much soot and ash from the volcanic activity beneath the Redridge Mountain Range. Some other dark bog seems to be seeping into it from underneath Mount Malchezzet however, and dark creatures have been seen within the quarry. One exit from the Forbidden Moorlands lies in the quarry. Known as the Quarry Chute, it was once used by the laborers to bring the stones down from the mountain. The Chute is an intimidating canyon with sheer cliffs on either side, unlike the exit on the other side of the zone. Known as Ilgalar’s Pass, this road has, between massive boulders, a view of the ocean and the Swamp of Sorrows as it leads up to the southernmost Signal Tower.